I’ve been on a haloumi cheese kick recently. Haloumi cheese is salty, chewy, creamy AND grill-able. Yes, a grill-able cheese. Sort of like paneer. Except that paneer lacks the saltiness of haloumi cheese. So what does one do with a salty, grillable cheese? You find a sweet, grill-able friend for it. Apples. I like to serve this on a narrow tray with a single layer of grilled apples topped with a layer of grilled haloumi. It’s an appetizer that looks elegant, accomplished and unique but really it’s a quick throw together. It takes about ten minutes on a Cuisinart Griddler . And I usually do it after the guests arrive because haloumi gets a little harder and chewier when it cools down. So I find it’s best served warm. Cut the apples into thin 1/4 inch thick slices. No need to peel the apples. Cut the haloumi in 1/4 inch thick rectangles. Heat a counter grill like the Cuisinart Griddler to medium hot. You can also use a skillet if you don’t have a grill. Whichever you are using, spray lightly with EVOO. Grill the apples first until they get translucent and soft. Arrange the apples on the tray. Grill the haloumi slices until golden on both sides. Haloumi let’s off water when you grill it then it becomes golden so don’t despair. Serve hot. Back when our daughter was a few weeks old, we had friends over and I hadn’t cooked anything because – well – we had a newborn and my kitchen was essentially closed. And we were planning to go out. So while I was tending to the baby in the other room, my husband decided to be a good host and put out an appetizer. I came back out to find a bag – yes a bag – as in still in the bag – of Stacey’s pita chips and a plastic tub of hummus on the coffee table. In his defense, he’s generally a good host, and we were both sleep deprived out of our minds. I love the story about your husband. My hubby would do the exact same thing, if he even thought to put out a snack at all! 🙂 Love the cheese apples combo. Where do you buy this cheese? 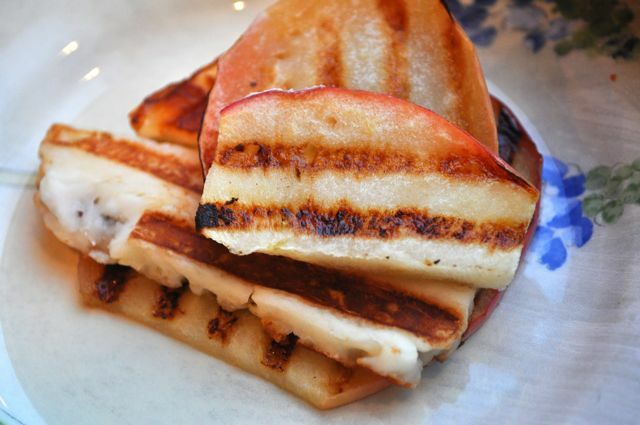 definitely have to try grilled haloumi now! do you have any other ideas than apples to pair them with? @Shirin – Haloumi is popular in Greece and the Middle East, so you can generally find it in Middle Eastern grocery stores. I buy mine from Sahadi’s or Damascus in Brooklyn (which I know does’t help you!). @Lalitha – I wouldn’t hestitate to grill and serve it plain with other apps like hummus, olives, etc. But the other thing I’ve been doing with it is chopping into 1/2 inch cubes, pan frying then adding to couscous with green bellpeppers, corn, red onion and preserved lemons. Likely to appear here soon. Hey why dont you sent this post to MFF event that I host along with a picture of the cheese.It is just to educate people of various things available in the market. I need to try this grilled Haloumi thing. Have heard a lot abt haloumi, but never tried it myself. Grilled apples & cheese sounds yummy. I have been looking for grilled desserts and this perfectly fits the bill, now only if I can get my hands on some of that cheese. This sounds wonderful! I have something like 20 apples in my fridge from my weekly Boston Organics orders and really I had no idea what to do with them besides make apple sauce. But I’m so going to throw them on the grill now and top them with Haloumi. You’re my hero!! What an elegant appetizer. Can’t wait to try it! Oh wow. Just WOW. This has my name written all over it! This sounds absolutely delicious! Please don’t discount feta in desserts until you have tried Khanafa. The combination of baked Feta and Shredded Phylo Dough that is drenched in syrup is totally to die for! On another note, I love reading about the foods you are cooking for Surya. Please keep blogging. @erincooks – I’ve been making homemade applesauce for Surya, and it’s amazing the taste difference between homemade and store bought. But you should definitely space some apples for this. Let me know how you like it! @tibik – That dessert sounds amazing! And thank you for the encouragement – it’s so nice to hear that people enjoy reading the blog. Btw I’m planning to put a little pinch of turmeric into Surya’s peas this weekend. Let’s see if she tastes it and likes it. I LOVE Haloumi! We grill it as part of our usual vegetarian grill sessions. If you rub it with olive oil and put it in a fish-grilling basket, almost every last drop ends up on the plate at the end rather than stuck to the grill. I usually end up wrapping bits of it in slices of grilled summer squash (marinated in lemon juice, olive oil and dill) or in strips of grilled red pepper. Recently, we grilled it and tore it up to mix with roasted potatoes/beets/carrots/onions and a white bean & artichoke heart saute. I love the idea of pairing it with apples, too. Will have to try it.